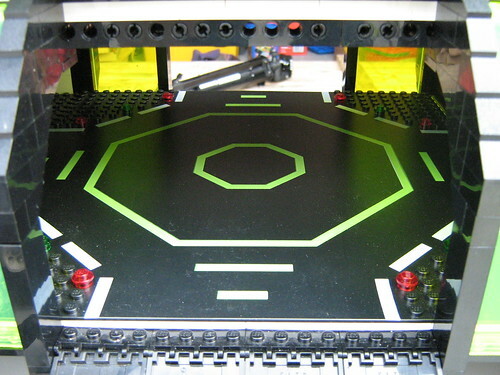 This is the Blacktron II. 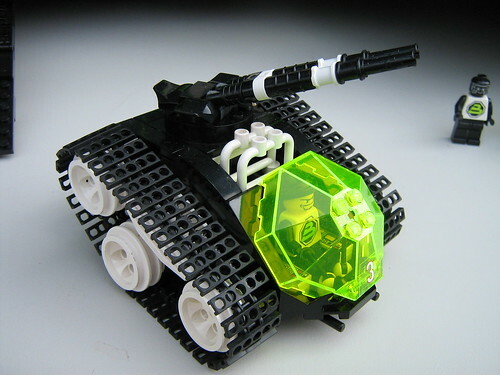 At the peak of the Blacktron privateering regime, they had acquired enough wealth to commission themselves a capital-class cruiser capable of carrying and deploying on the surface two mini-tanks, a 10 troop APC, a small mech, cargo and scout droids and 20 grunts. These mercenary pirates were ruthlessly efficient at getting the job done. 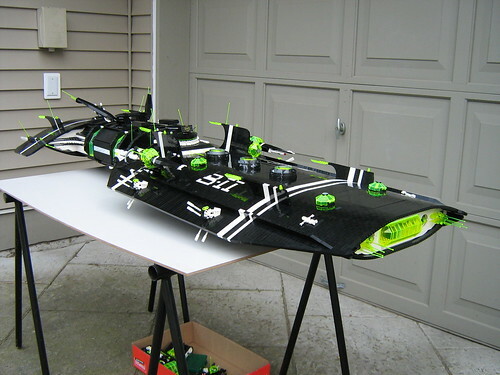 At almost six feet long and containing roughly 15,000 pieces, this is the largest creation to date. A truly incredible build! The exterior design is so sharp, love the color work and curves! Congrats on MOTD! congratulation to MOTD ! well deserved ! This is quite simply an incredible creation. The backstory fires my imagination too. Great work! That shape is just so cool! 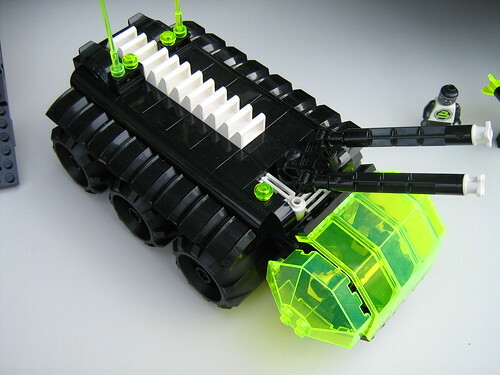 Just the fact that it is possible to do that with Lego is amazing! 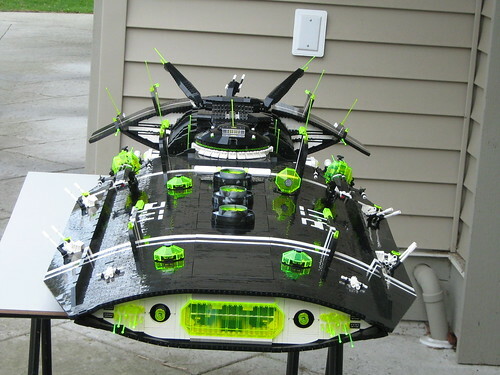 Great work, the shape of the ship is perfect, this is by far one of the best MOCs I have ever seen! Keep it up! Great ship! The shape is absolutely brilliant, to say the least! 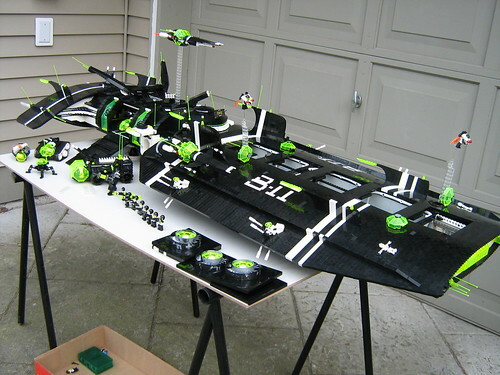 awesome i dont know what to say it need to take building months !!! bravo and excellent shape sereusly it is fantastic!!!!! this is so sleek! I love it! Surely one of the most unique SHIPs around - can't get enough of this one! Well done for producing what must have been a challenging build - those curves are wonderful! That is pretty amazing. Are you displaying that at a convention? Seriously awesome. The details in the interior are great. O_O !!!!! (speechless)THAT IS TOTALY EPICLYEPICELECIPELNEESLY AWESOME!!!!! This is one of the best SHIPS I have seen! I like the successful use of the driving wheels for normal wheels on the fuel transport thing (something I had tried before and failed). It's Huge! I love every little detail! Awesome! that is so amazing! wow! its huge! : [_____] Oh My Goodness! Fantastic! Amazing! Superb! Excelent! Awesome! 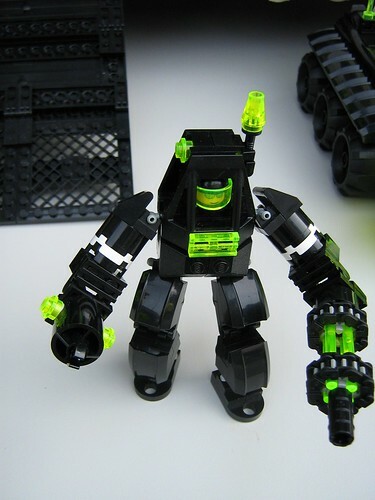 And cool mech. 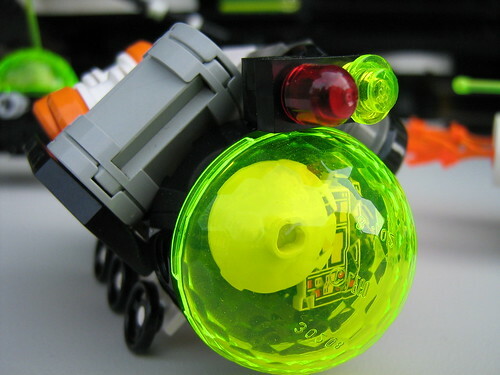 2 years have passed, and this is still my favourite MOC on MOCpages. Or anywhere. This has to be the second best SHIP of all time. Here's a rare 5/5 and favourite. *Applauds* This is the best SHIP EVER, seriously I have never seen anything like that. The shape is unique, details are awesome, and the overall look rocks! BRAVO!!! how many pecies did that use !??? Holy *$&i!I can't beieve somebody could build this!!! Oh my frickin' frick. I want this. Wow,just wow.I'm stunned,this is beautiful,and certainly one of the best ships i have ever seen. That is AMAZING! 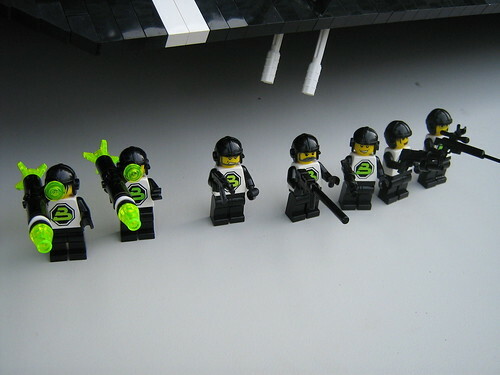 just the fact that it can deploy troops like that is an awesome feat. I like that hardsuit alot. This is probably the best S.H.I.P. I've ever seen, and I have no idea why I haven't noticed it before. Incredible! You r detail work is amazing! Wow - this is amazing! Oh my gosh, this is FANTASTIC! This is up there with Mark Kelso and his ships, maybe even higher. 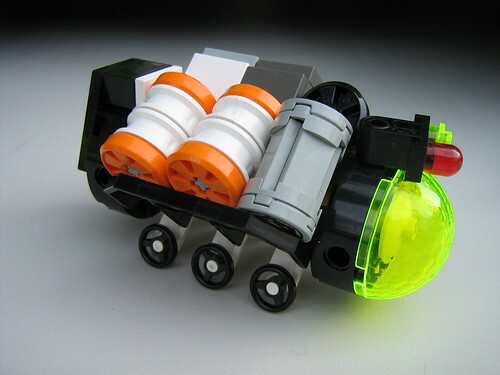 Definitely the best Blacktron creation ever, and it will undoubtedly stay this way. Really just astounding detail, and perfectly SNOT almost everywhere. OMG, this is...umm im speechless. 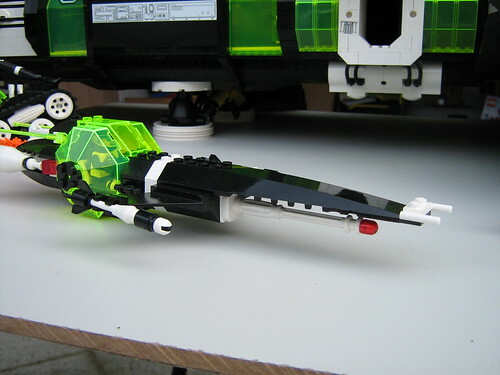 The shape in this shipi and ewerything, 1 of the best shipis in mocpages. This is amazing :O! I love big ships, and this is one of the best I've seen. Superfantabulous. I'll never figure out how you got that round shape, though. The last pic also looks like the ship from Alien (the first one, the best one). Good luck in the future! *Gasp* I can't put the beauty into words! Blacktron II is awesome! Realy great! I love engines on ship and mechas used by those pirate guys! Wow. 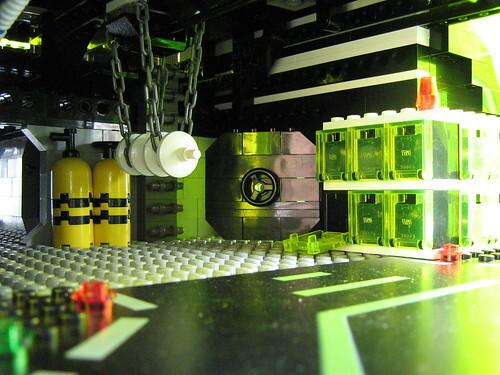 If you're able to put a baseplate INSIDE of a ship...that's just win, man. This ship will always be one of my favorites from you. Its sheer awesomeness factor just blows me away! Very cool! 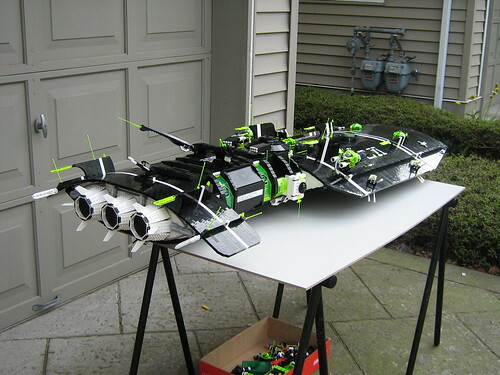 I too make large scale spaceships... I wonder if there is a way of showing them someplace in person, like a gallery? Your creation is simply incredible. I am beyond impressed in the design and the detail, and I appreciate the amount of work you put into it. And BTW, somebody told me about this site, and linked me to your page for me to see what the site was all about. And it was your page that inspired me to make my own page to show off my own creations. So, thanks for the inspiration! ..... It is HELLISH AWESOME! Where'd you get THIS amount of black and white pieces? 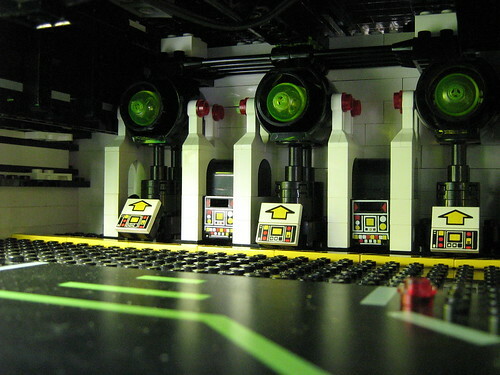 Unbelievably complex, and HUGE, this is certainly what I call a love for Blacktron II! 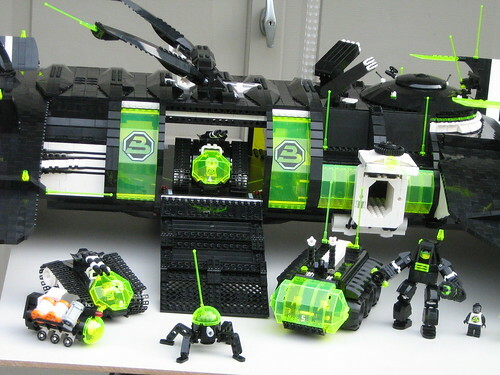 For someone to spend as much time as you did on one MOC, this massive, you'd have to be crazy about the theme! Here's a good example of staying on task and sheer determination. Job well-done! 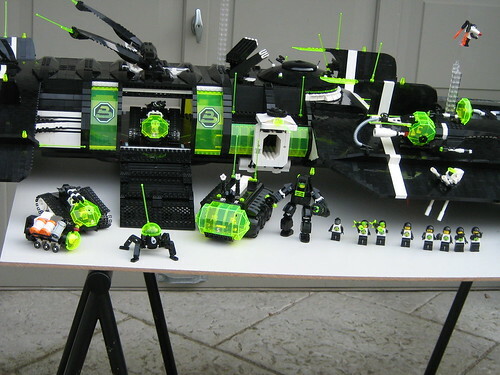 HOLY BLACKTRON !!! ... (as Robin would say to Batman) ... OMG, GEEEZE, WOW, DAAAYNG, and WHOOAH are other words that comes to mind as i continue to look this incredible BEAST of a ship over and over again ! ... LORDY MERCY, i just can't get over how HUGE and beautifully detailed that ship is ! I am so blown away each time I see this! Amazingly cool design. You have all kinds of special attention areas that are fun to see all over this giant SHIP! I have taken time to look at your detail shots. So much to consider! Lot's of accessories and support equipment. 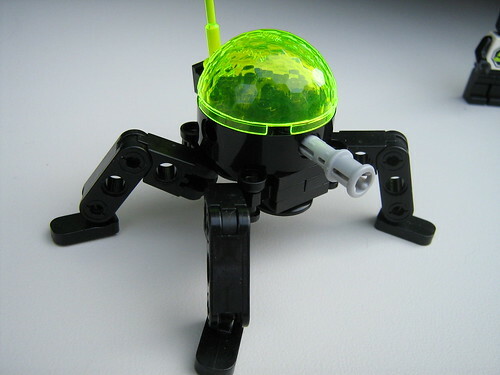 I heard many people enjoyed seeing this when you brought it to a Lego Fest. KUDOS! This almost makes me like BTII more than BTI... arguably the most original SHIP ever. What a huge beauty! I love curved top! Nice little details and all vehicles are awesome! Amazing job! I know this wonder since a long time, but never commented on it. I think it's the best ship I ever seen alongside with The Invisible Hand. 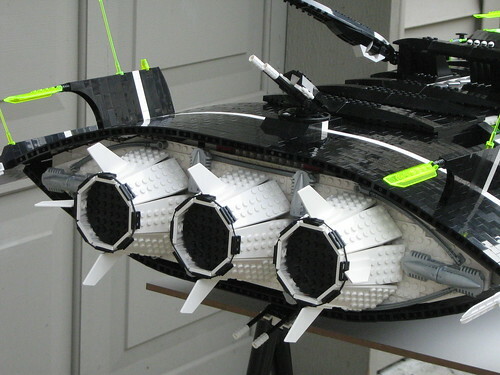 I've just made a (little) Blacktron II cruiser which could almost be carried in the back of that AWESOME beast. Congratulation for this build !!! Amazing. Lovely curves, there. It looks excellent! PURE awesomeness!! This thing ROCKS!!! This is my favorite SHIP ever. It helps of course that it belong to my favorite faction ever and that you have a few uses of my favorite cockpit ever. Beautiful beyond belief! I've seen this before, but it's hard not to be amazed again. The curved hull is something I've never encountered before or since, and it's pure genius. Amazing work.